Tax Credit Can Be Used On Minneapolis Duplex Closing Costs | Your best resource for buying, selling, owning and investing in duplexes and duplex homes. Some days I wonder if everybody in the Department of Housing and Urban Development is wearing a blindfold. After all, they keep stumbling around, swinging sticks at the housing pinata, hoping to connect with a way to make the $8000 first time home buyer tax credit more effective. On Friday, HUD announced their plans to monetize the $8000 first time home buyer tax credit; giving FHA-approved lenders the go ahead to develop bridge-loan products that enable buyers to use the credit toward closing costs or to increase the amount of their down payment from the mandated 3.5 percent. In other words, first time home buyers still have to come up with the 3.5 percent down. Most first time home buyers ask the seller; whether a bank or a private party, to pay their closing costs. Essentially, the buyer pays these fees as part of their loan. The seller simply nets less at closing because those expenses are deducted from the duplex’s gross sales price. HUD maintains there are many sources of help with the 3.5 percent down payment; referencing state and local governments as well as nonprofit lenders. Some state housing finance agencies have developed their own bridge loan programs, enabling first time home buyers to use the tax credit for the down payment. Unfortunately, Minnesota’s HFA isn’t among them. Nice try, but they didn’t quite break open the pinata. While I understand the theory that those who can’t afford a down payment can’t afford a duplex, traditional sources for help, like mom and dad, may not be as flush in this downturn as they might normally be. What’s more, many of the bank-owned properties are missing important things; like appliances; which is an expense common in this market. Therefore, cash for a down payment remains the big problem. 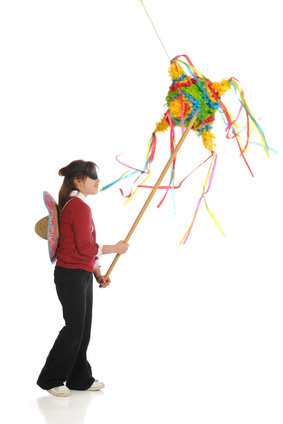 If they would break open the pinata, they’d see everybody scramble for the housing candy. Let’s hope HUD gets it right. Eventually.